Laughter, Love and a Furry Brother. Who Could Ask for More? 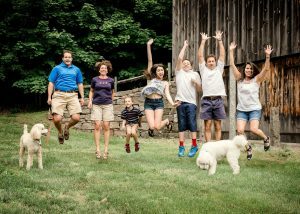 When we first tried to do this family’s photography session, it was part of an extended family session. They were kind enough to let everyone else go first, and when it was their turn, the clouds opened up. So we rescheduled, and that next date it stormed. Finally, it was third-times-a-charm! And honestly, I know God knew what he was doing because we decided to change our location and just do their portraits in their own yard. With the blooming hydrangeas and other beautiful landscaping, it was the perfect setting for them. We started the session in their front yard with the formal “for the wall” portrait. But after that, we let loose and the giggles began. This little boy was having a ball getting tons of love from his parents. Playing the “who can give more kisses” game, her little man was determined to win. But, what can I say, Mommas are so good at giving kisses they are just hard to beat. When your little brother is covered in fur and plays a fast-paced game of chase, you just have to give him a big cuddle when the game is done. This image is going to melt Momma’s heart. Besides, family photos with dogs in them always bring you back to the happiest memories. Dad needed a rest here and was happy to share the moment with his son. You see he spent the morning cutting the entire yard since their new yard service didn’t show up. But in the end, the yard looked fantastic and was a blast to roll around in. Sneaking up on Mom, her son came in for a quick tickle and she surprised him when she caught him by the arms. He was such a lively little boy. I even stayed after the session so he could show me his collection of metallic and glow-in-the-dark putty. Riding on Daddy’s shoulders is a fantastic memory. It won’t be too long before his son is too big to balance up there, but for now this was a great game! I totally missed the joke here, but as you can see, it was excellent. Oh to laugh like that, with total abandon! I even love the missing teeth. They’re both going to look back at this image for years to come and remember the happiness that they all felt that day. Finally, I had to post this image because it was my favorite from the session. He was just goofing around while I was playing with my camera settings, and I happened to catch him in full laughter. This little man is definitely growing up in a house full of love.